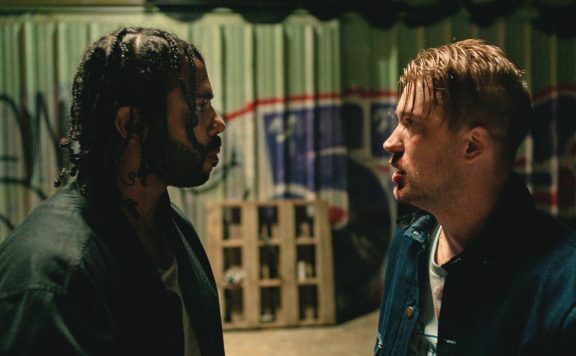 Aaron Neuwirth reviews Blindspotting, a terrific feature taking a look at the Oakland of today through the lens of two best friends. Perception can be a tricky thing. Blindspotting refers to a visual exercise seen in the film that’s all about what image registers to the mind. For some, this film can be looked at as a comedy-drama that treads familiar ground once covered by Spike Lee, John Singleton, and The Hughes Brothers, among others. Others will understand what’s different. While the concept of race and how various people feel about certain individuals is not about to be abated in any realistic way, it’s not as if all angles can be covered, let alone solved by media. Blindspotting doesn’t seek out to provide answers. What it does accomplish is telling the story of a few individuals who continue to live through a changing environment, while presenting some powerful anecdotes that feel all too relatable. Plenty of people like to use the word “urban” when describing this sort of film. It’s not inaccurate, but it’s interesting how pointed the term tends to feel. Blindspotting tells the story of two lifelong friends, who live in the urban environment of Oakland, California. Collin (Daveed Diggs) is a convicted felon who is getting through his last three days of one year’s probation. Miles (Rafael Casal) is Collin’s troublemaker best friend, who lives with his girlfriend Ashley (Jasmin Cephas Jones) and their young son. As the film starts up, it’s very evident that comedy and drama will emerge from Collin and Miles daily trials living in Oakland. The film is set in 2018, and the city has gone through many changes over the past few decades. While there are still plenty of areas known for the occupants that embrace a “street” lifestyle, much of Oakland has gone through rapid gentrification. Modern apartments and hipster locales have replaced older buildings and business. Black citizens, among other non-white populations, have not been removed, but there’s certainly a broader mix of what’s being seen. The two friends quickly observe the changes. Whether it’s the gun dealer who doubles as an Uber driver or the presence of Kale-flavored drinks up front at the local liquor store, things are shifting. 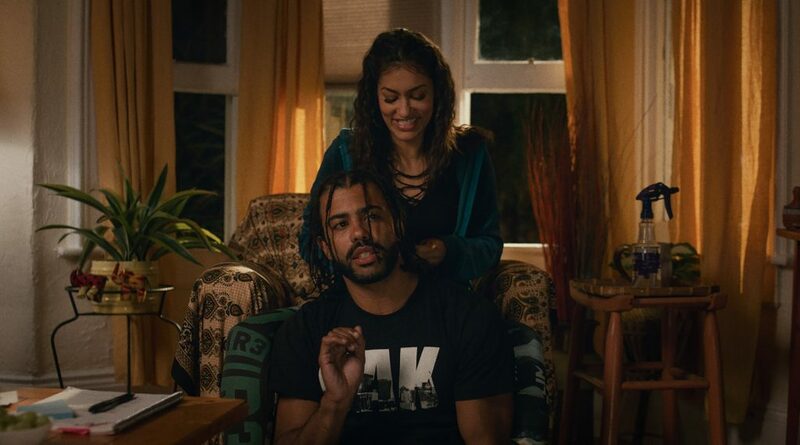 Having recently reviewed Sorry to Bother You, which takes a look at Oakland through the lens of a corporate satire, with some bizarre, fantastical elements thrown in for good measure, it was interesting to see the city from Blindspotting’s point of view. Written over the course of nine years by real-life friends Diggs and Casal, who grew up in Oakland, there’s a real attempt to capture the life of the city they’ve experienced over the course of their lives. Director Carlos López Estrada has done an excellent job of framing their voice in a way that delivers a feeling of honesty and vibrancy. With the leads working as movers, the audience gets to see a lot of different areas of Oakland, which, in turn, leads to seeing how the city functions. In addition to the unique locations, whether it be colorful shops or rundown homes, there’s the wheeling and dealing Miles uses to get ahead, along with the attitudes of the various people encountered. There’s also the simple truth of what separates Collin and Miles. Regardless of how much these two want to comment on how their home has changed, one thing that hasn’t is the perception of Collin, when it comes to what people see. It’s that sad reality that propels much of the drama in this film. 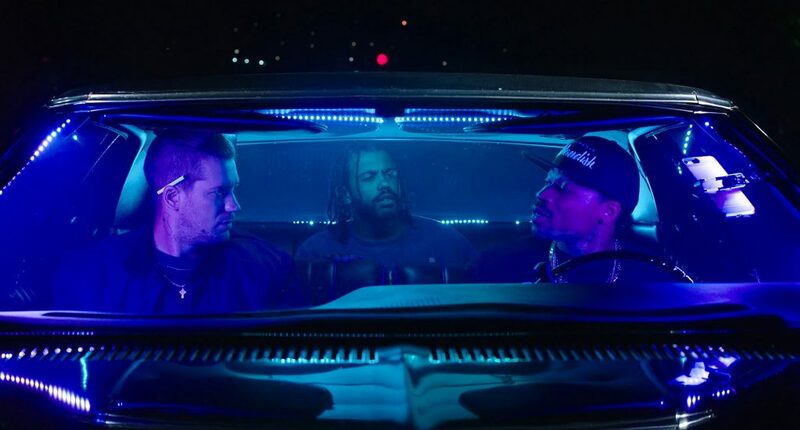 While Blindspotting is relatively light on plot, the main throughline comes in the form of trauma experienced by Collin, following his witnessing of a police officer (Ethan Embry) shooting an unarmed black man in the street. As the film only takes place over the course of a few days, we see the kind of effect it has on his psyche, let alone the sort of fallout that comes from continuing to stick with his rabble-rousing best friend. There are certain surprises and tense moments I do not need to get into, but Blindspotting succeeds at making us acutely aware of what’s at stake for the people involved. If Do The Right Thing and similar films that eventually came in the ‘90s tackled race relations and the effect of gang culture, this film feels like an appropriate way to catch us up with where things are now. Especially when considering the youthful age of the cast of a film like Boyz n the Hood, we now have a film focused on characters in their 30s. 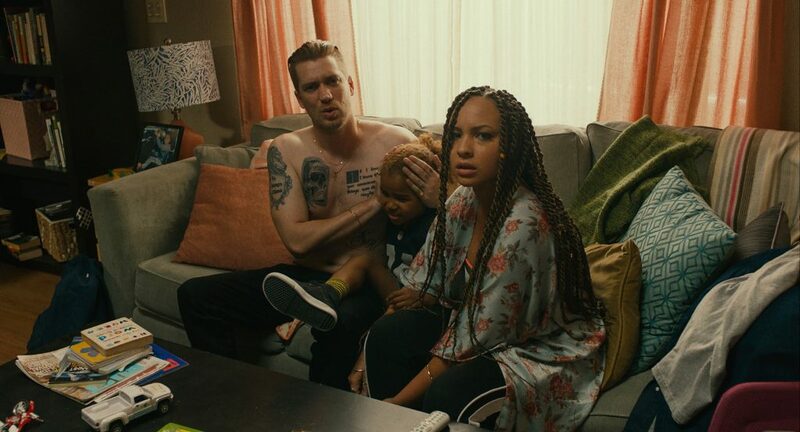 Despite being in a different part of the country, Blindspotting is the kind of film that gets into what’s happening now, from a familiar perspective. The film also does an excellent job of filling us in with what we need to know about the characters we care about. Janina Gavankar co-stars as Val, Collin’s ex-girlfriend, and the film finds a wonderful way to keep her involved in this story and not rely on melodrama to fill in the blanks surrounding what separated the two of them. At the same time, the chemistry between Diggs and Gavankar is strong enough to inform further who both of these people are and make one wish for an alternate version of the stories that unfold. This is to say that none of the characters are bad people, as the film’s true antagonist comes in the form of the wrongdoings of certain societal norms, as sad as that may be. Even Miles, who loves embracing the culture he grew up with, is the sort of guy you can trust to have your back, granted you’re on his side of things. He may have a short temper and make the wrong decisions sometimes, but it doesn’t mean he’s not clearheaded enough to want to support his family or have the means to protect them. Ultimately, however, it comes back to Collin. Already having garnered plenty of acclaim for his work as a rapper and singer, along with award-winning work in the musical Hamilton, Diggs feels perfectly at home in this film. He has all the presence he needs in this film, doing plenty of dramatic lifting, and getting exceptional support from Casal and all the other cast members around him. Still, when it comes time to approach some of the more heightened scenes from a cinematic standpoint, the incorporation of Diggs emotions and abilities plays into some powerful moments that speak to what the film wants to provoke in its viewers. 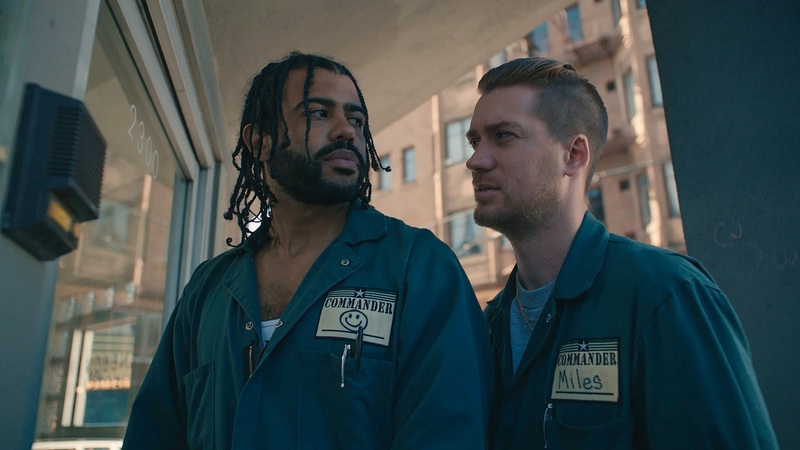 When Blindspotting focuses on the comradery between Collin and Miles, it’s a fun burst of energy put on screen. As the film delves into its more significant ideas, the tonal shifts can feel sharp, but I couldn’t help but be fascinated by the ideas being relayed. Putting the city of Oakland on display like this feels assured and timely. The use of real locations, a terrific cast, and just enough cinematic ambition to balance the story in a fresh way made this a film I couldn’t get enough of. 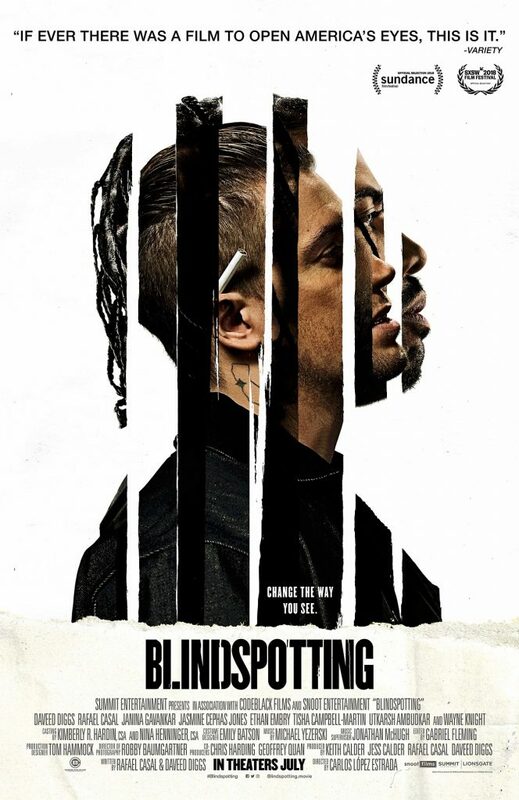 Perception may vary for some, but Blindspotting turned out to be exactly what I wanted to see.